Multiple gables, columns, and a balustrade add stature to the facade of this four-bedroom traditional. Both the foyer and great room have impressive two-story ceilings and clerestory windows. The great room is highlighted by built-in bookshelves and French doors that lead to the back porch. The breakfast bay features a rear staircase to the upstairs bedrooms and bonus room. Downstairs the master suite enjoys an indulgent bath with large walk-in closet, while a bedroom/study offers lots of flexibility nearby. 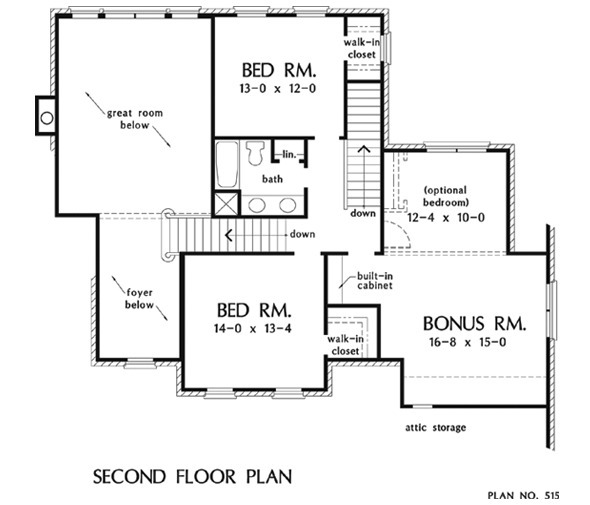 Note the optional fifth bedroom in the bonus room. 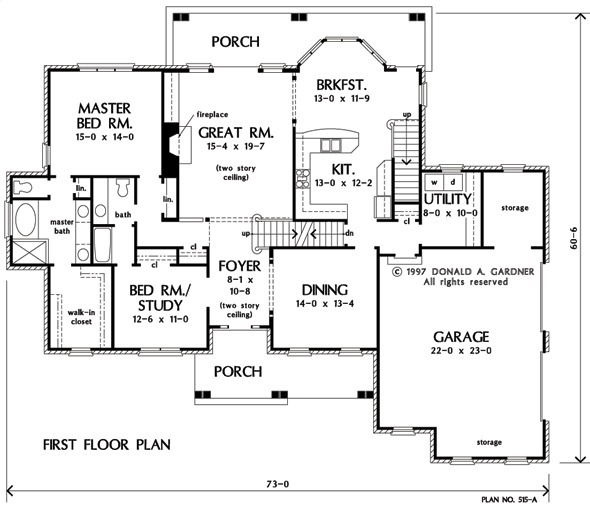 1st Floor: 2067 Sq. Ft. Bonus Room: 433 Sq. 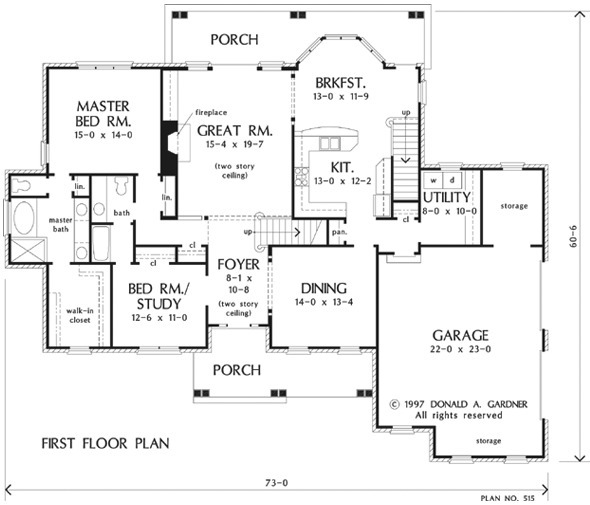 Ft.
House Dimensions: 73' 0" x 60' 6"
Great Room: 15' 4" x 19' 7"
Foyer (2 Story): 8' 1" x 10' 8" x 18' 0"
Great Room (2 Story): 15' 4" x 19' 7" x 18' 0"
Kitchen : 13' 0" x 12' 2" x 9' 0"
Breakfast Room : 13' 0" x 11' 9" x 9' 0"
Utility Room : 8' 0" x 10' 0" x 9' 0"
Bonus Room : 16' 8" x 15' 0" x 8' 0"
Garage Storage : 8' 0" x 10' 0" x 0' 0"
Bedroom / Study : 12' 6" x 11' 0" x 9' 0"
Bedroom #3 : 14' 0" x 13' 4" x 8' 0"
Bedroom #4 : 12' 4" x 10' 0" x 8' 0"
Porch - Front : 24' 1" x 6' 0" x 0' 0"
Porch - Rear : 33' 11" x 7' 0" x 0' 0"
Storage (Other) : 14' 4" x 4' 0" x 0' 0"